Download "CHAPTER 26. 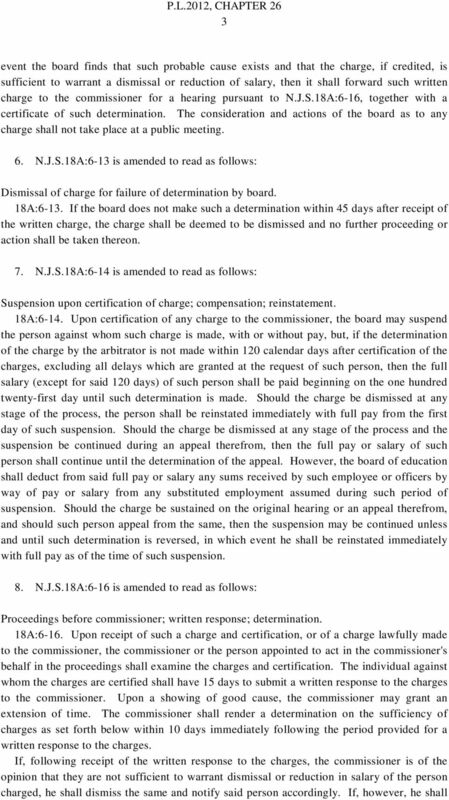 BE IT ENACTED by the Senate and General Assembly of the State of New Jersey:"
1 CHAPTER 26 AN ACT concerning school employees, revising various parts of the statutory law, and supplementing chapters 6 and 28 of Title 18A of the New Jersey Statutes. BE IT ENACTED by the Senate and General Assembly of the State of New Jersey: C.18A:6-117 Short title. 1. 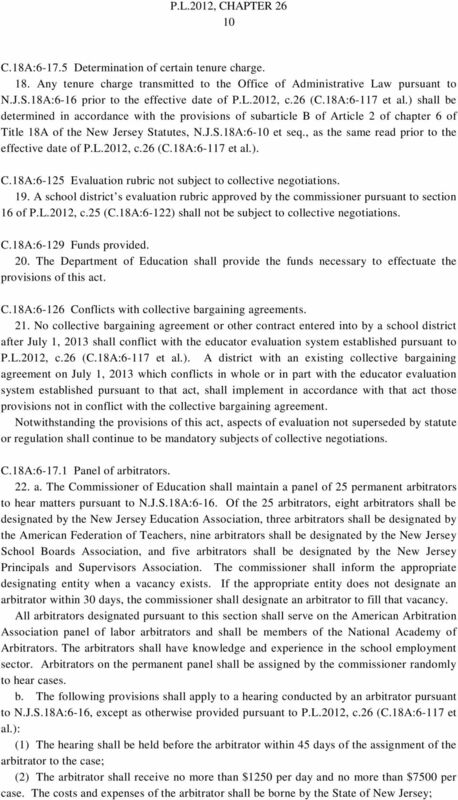 This act shall be known and may be cited as the Teacher Effectiveness and Accountability for the Children of New Jersey (TEACHNJ) Act. 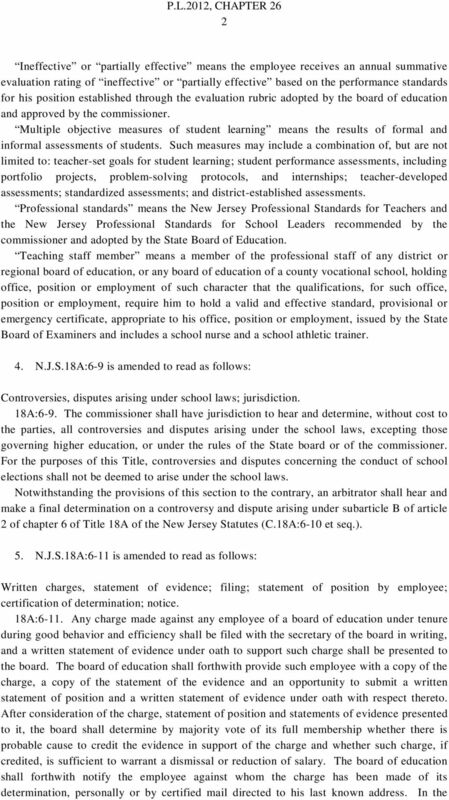 C.18A:6-118 Findings, declarations relative to the TEACHNJ Act. 2. The Legislature finds and declares that: a. The goal of this legislation is to raise student achievement by improving instruction through the adoption of evaluations that provide specific feedback to educators, inform the provision of aligned professional development, and inform personnel decisions; b. The New Jersey Supreme Court has found that a multitude of factors play a vital role in the quality of a child s education, including effectiveness in teaching methods and evaluations. 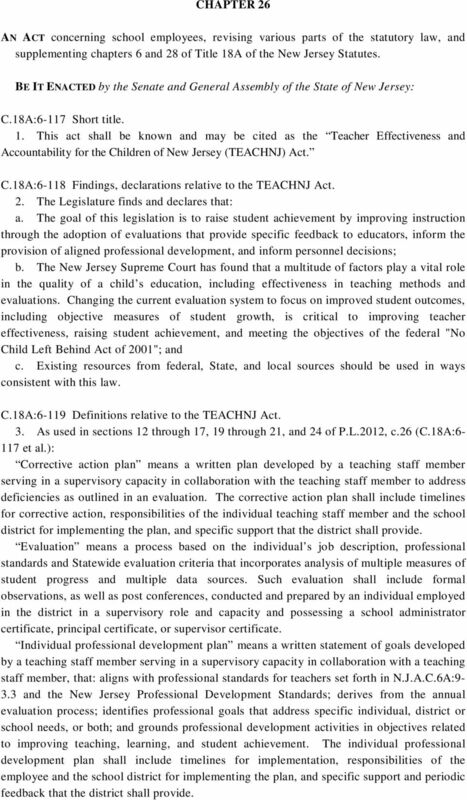 Changing the current evaluation system to focus on improved student outcomes, including objective measures of student growth, is critical to improving teacher effectiveness, raising student achievement, and meeting the objectives of the federal "No Child Left Behind Act of 2001"; and c. Existing resources from federal, State, and local sources should be used in ways consistent with this law. 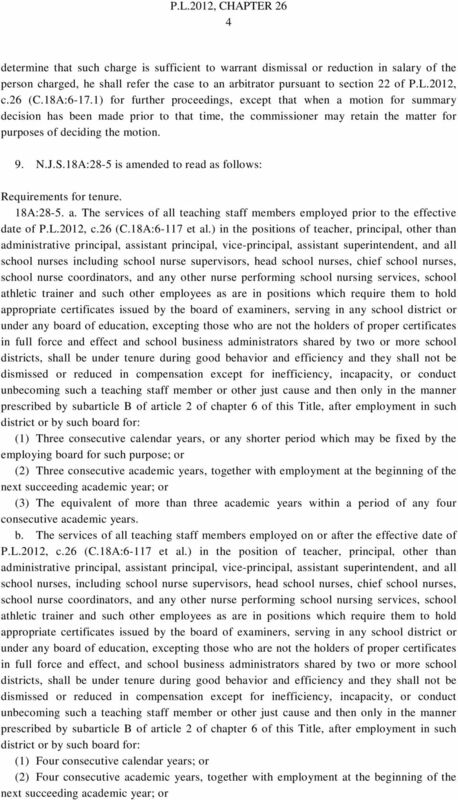 C.18A:6-119 Definitions relative to the TEACHNJ Act. 3. As used in sections 12 through 17, 19 through 21, and 24 of P.L.2012, c.26 (C.18A:6-117 et al. ): Corrective action plan means a written plan developed by a teaching staff member serving in a supervisory capacity in collaboration with the teaching staff member to address deficiencies as outlined in an evaluation. The corrective action plan shall include timelines for corrective action, responsibilities of the individual teaching staff member and the school district for implementing the plan, and specific support that the district shall provide. Evaluation means a process based on the individual s job description, professional standards and Statewide evaluation criteria that incorporates analysis of multiple measures of student progress and multiple data sources. Such evaluation shall include formal observations, as well as post conferences, conducted and prepared by an individual employed in the district in a supervisory role and capacity and possessing a school administrator certificate, principal certificate, or supervisor certificate. Individual professional development plan means a written statement of goals developed by a teaching staff member serving in a supervisory capacity in collaboration with a teaching staff member, that: aligns with professional standards for teachers set forth in N.J.A.C.6A:9-3.3 and the New Jersey Professional Development Standards; derives from the annual evaluation process; identifies professional goals that address specific individual, district or school needs, or both; and grounds professional development activities in objectives related to improving teaching, learning, and student achievement. 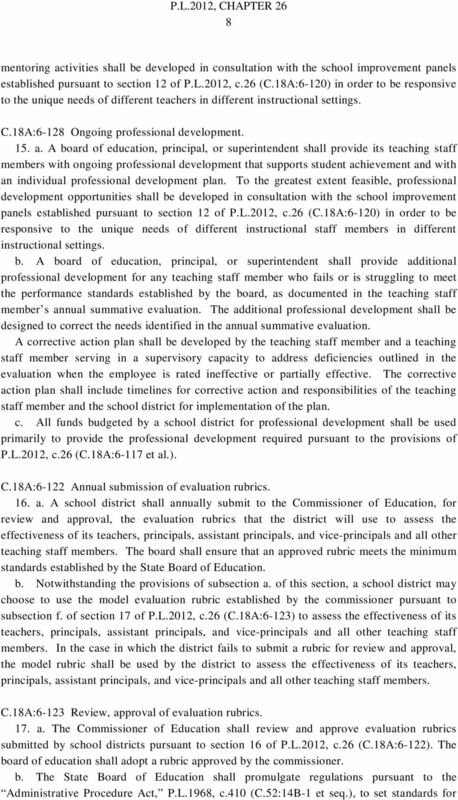 The individual professional development plan shall include timelines for implementation, responsibilities of the employee and the school district for implementing the plan, and specific support and periodic feedback that the district shall provide. 9 9 the approval of evaluation rubrics for teachers, principals, assistant principals, and viceprincipals. The standards at a minimum shall include: (1) four defined annual rating categories for teachers, principals, assistant principals, and vice-principals: ineffective, partially effective, effective, and highly effective; (2) a provision requiring that the rubric be partially based on multiple objective measures of student learning that use student growth from one year s measure to the next year s measure; (3) a provision that allows the district, in grades in which a standardized test is not required, to determine the methods for measuring student growth; (4) a provision that multiple measures of practice and student learning be used in conjunction with professional standards of practice using a comprehensive evaluation process in rating effectiveness with specific measures and implementation processes. Standardized assessments shall be used as a measure of student progress but shall not be the predominant factor in the overall evaluation of a teacher; (5) a provision that the rubric be based on the professional standards for that employee; (6) a provision ensuring that performance measures used in the rubric are linked to student achievement; (7) a requirement that the employee receive multiple observations during the school year which shall be used in evaluating the employee; (8) a provision that requires that at each observation of a teacher, either the principal, his designee who shall be an individual employed in the district in a supervisory role and capacity and who possesses a school administrator certificate, principal certificate, or supervisor certificate, the vice-principal, or the assistant principal shall be present; (9) an opportunity for the employee to improve his effectiveness from evaluation feedback; (10) guidelines for school districts regarding training and the demonstration of competence on the evaluation system to support its implementation; (11) a process for ongoing monitoring and calibration of the observations to ensure that the observation protocols are being implemented correctly and consistently; (12) a performance framework, associated evaluation tools, and observation protocols, including training and observer calibration resources; (13) a process for a school district to obtain the approval of the commissioner to utilize other evaluation tools; and (14) a process for ensuring that the results of the evaluation help to inform instructional development. c. A board of education shall adopt a rubric approved by the commissioner by December 31, d. Beginning no later than January 31, 2013, a board of education shall implement a pilot program to test and refine the evaluation rubric. e. Beginning with the school year, a board of education shall ensure implementation of the approved, adopted evaluation rubric for all educators in all elementary, middle, and high schools in the district. Results of evaluations shall be used to identify and provide professional development to teaching staff members. 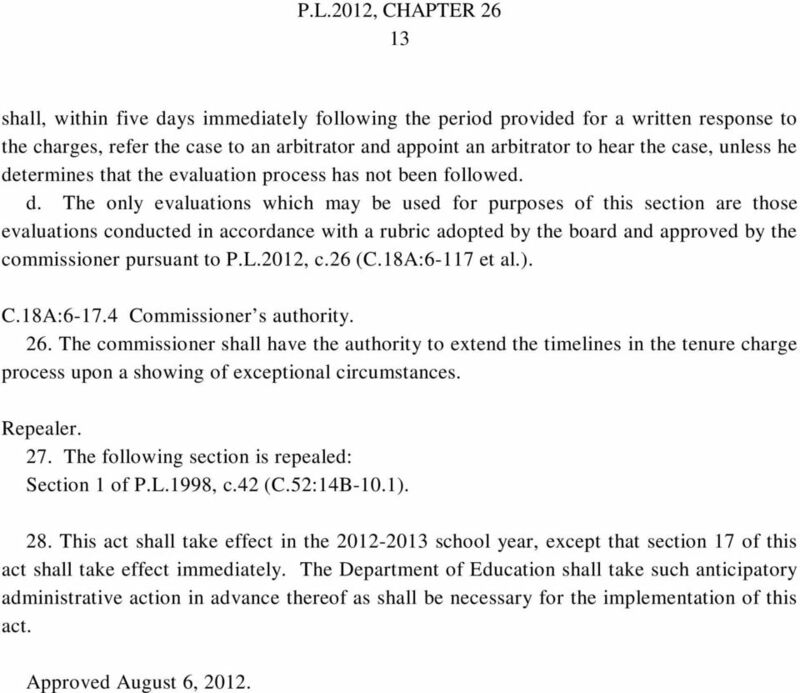 Results of evaluations shall be provided to the commissioner, as requested, on a regular basis. 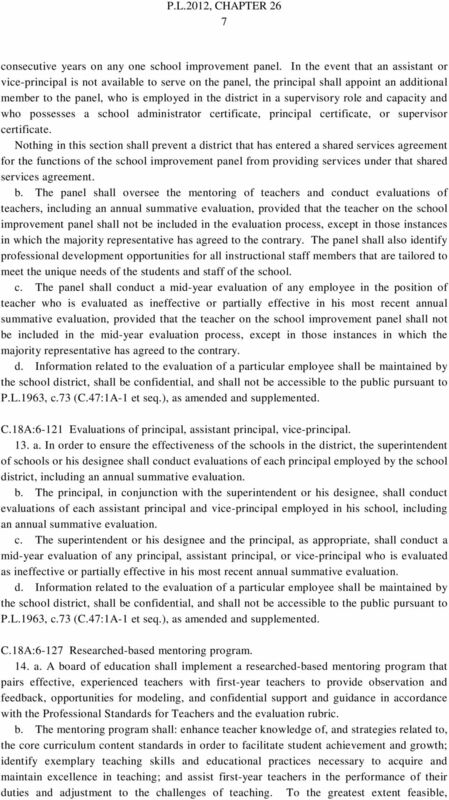 f. The commissioner shall establish a model evaluation rubric that may be utilized by a school district to assess the effectiveness of its teaching staff members. 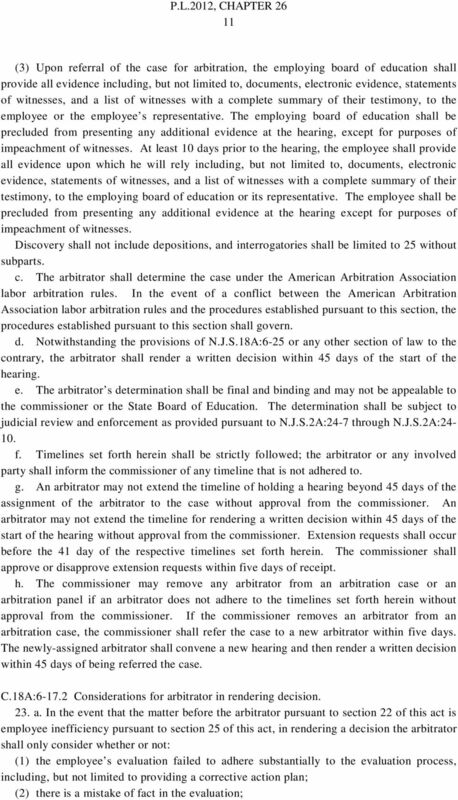 13 13 shall, within five days immediately following the period provided for a written response to the charges, refer the case to an arbitrator and appoint an arbitrator to hear the case, unless he determines that the evaluation process has not been followed. 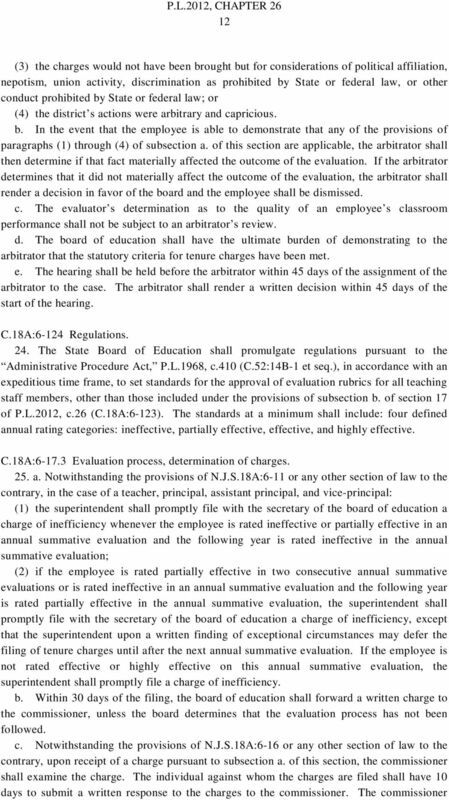 d. The only evaluations which may be used for purposes of this section are those evaluations conducted in accordance with a rubric adopted by the board and approved by the commissioner pursuant to P.L.2012, c.26 (C.18A:6-117 et al.). C.18A: Commissioner s authority. 26. The commissioner shall have the authority to extend the timelines in the tenure charge process upon a showing of exceptional circumstances. Repealer. 27. The following section is repealed: Section 1 of P.L.1998, c.42 (C.52:14B-10.1). 28. This act shall take effect in the school year, except that section 17 of this act shall take effect immediately. The Department of Education shall take such anticipatory administrative action in advance thereof as shall be necessary for the implementation of this act. Approved August 6, 2012. PLEASE NOTE This document, prepared by the Legislative Counsel Office, is an office consolidation of this regulation, current to August 30, 2014. It is intended for information and reference purposes only. CHAPTER 409. AN ACT concerning organized delivery systems for health care services or benefits. CHAPTER 48. AN ACT concerning organ donation and revising parts of the statutory law. ADMINISTRATIVE OFFICE OF THE COURTS STATE OF NEW JERSEY RICHARD J. WILLIAMS, J.A.D. P.O. BOX 037 ADMINISTRATIVE DIRECTOR OF THE COURTS TRENTON, NEW JERSEY 08625-0037 (609) 292-8553 DAVID P. ANDERSON. JR.